We've made it around to another Monday! Thankfully I have the day off and I plan to spend it in my craft room. I'm so excited to be one of the SURPRISE stops on Taheerah Atchia's Advent Calander Extravaganza! 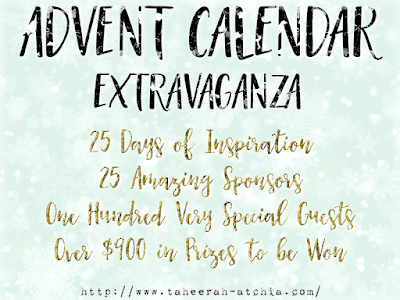 Joining in the fun with Taheerah are ONE HUNDRED special guests - each serving up some fantastic Christmas inspiration! Just like an Advent Calendar, you’ll never know where you’re going to be visiting next until you ‘open the door’! It’s not a party without a prize - and with prizes every day there are several chances to win! Today’s prize is generously supplied by Waffle Flower so you’ll definitely want to win! Simply leave a comment on this post - then head back to taheerah-atchia.com and leave a comment there too! I just adore Nina from Waffle Flower and I had tons of fun playing with their stamps! I had a very specific idea in mind once I picked up the First Step stamp set. I first fell in love with the bow included in the set and thought it would look amazing on top of a present. I looked at the rest of the accessories included in the set and realized that most of them would! I stared by stamping the present toppers and then used a T-Square ruler to create my own presents. I masked the presents and decorated my wrapping paper with some of the smaller images from Cold Hands. After looking at these cute little mice I couldn't help but include them! They just looked completely mischievous and honestly my kind of people haha! I was finally able to get this video edited though I basically told random stories the whole time haha. Even though I had to work through a bunch of things I didn't love it was worth it because in the end I had a card I did love. Don't start over peeps. You can fix it! Eep! So cute! those mice! Wow! Love the beautiful blending and such cute images with wonderful layering! All of the beautiful colors within your card - stunning! Super cute and lovely creation :) Beautiful coloring!! ❤️💖💝💗 this glowing card! Your hire accents really take this card to a new and amazing level of awesomeness! Beautiful coloring too! TFS! This card immediately put a big grin on my face. Love those mice! Those little mice are just the cutest...what a great card. Cheers. I love the beautiful coloring technique in your Christmas scenes! These are amazing! Such a cute card! I love the little mice. Love it! Great colors and cute mice! Oh how cute! Seriously, this looks printed, not handmade - WOW! I love all the great rich colors and that cute little mouse! Thank you for the beautiful holiday inspiration! Cute card, such beautiful coloring. Love this card, you are always so creative. Thanks for the inspiration. I am totally crazy about this one! Love the mice dancing on a ballroom of packages...so much fun. I will definitely look for the video! I am hurrying up with this post because I DON'T have the day off. (I am so jelly!) But, three days til my break, then crafting and cleaning and Christmas. thank you for this inspiration. WOWZERS! This is absolutely gorgeous coloring and design! So glad you persevered through the challenges to design this clever, sweet mice-and-gifts card for us! As always, bedazzled by your creativity (I don't comment often enough, but I haven't missed a post/video the entire year! You have no idea how much you've taught me about copic colouring, image placement and the importance of having 'confidence' in our efforts. So appreciated!). So thrilled that you're part of Taheerah's Advent Extravaganza; I'll be back to watch your video! Cute! I love your coloring! Such lovely colors! A beautiful card! What a great card! Your coloring is wonderful! Thanks for sharing! Lovely card. That is gorgeous inking, and the mice are too cute! Love those mice cavorting about on the packages - and all the colors and sparkle; it's a great card!! the little mice are darling. I love the colors in this card. The bow is spectacular. Thank you for sharing. Your coloring is exquisite! Awesome card! Your card is so vibrant and pretty! I love all the festive Christmas colors you used. That Twist Citron stamped background is my favorite!!!!! :) Happy holidays! Darling card! Love those sweet mice and your beautiful coloring! Such a fun scene card! Wow you did an amazing job crating those presents. I love everything about this card! Love your had created presents! Beautiful! Love how the green looks against the mice and presents! This is gorgeous, Kelly, wonderfully coloured as usual, and the scene you created is really cute! Even though you had a few problems it was worth it. The card is beautifully done. I love using the flower as a bow. Great background and fabulously created presents and wrapping paper. Stunning card. Your coloring is amazing. The colors pop! And those mice are so cute and seem so busy! Gorgeous card!! Fab coloring too! I love your coloring so vibrant and detailed! Love this beautiful little card. Your coloring skills and talent are among the very best. Wow, stunning card! I love the bows and super cute mice and your coloring is amazing. So clever to just make your own presents with a T-square and some masking for this pile of gifts. Looking forward to the video on this one, thanks! Of course your coloring is WONDERFUL and the mice make it such a happy card! This is a fantastic card. How do you do it every time? I love the big bold accents on the presents, but I think my favorite is the bejewelled snowflake. So pretty. And those are definitely some mischievous mice dancing/skating through the packages. I'm sure your peanut was in no way an inspiration for that. 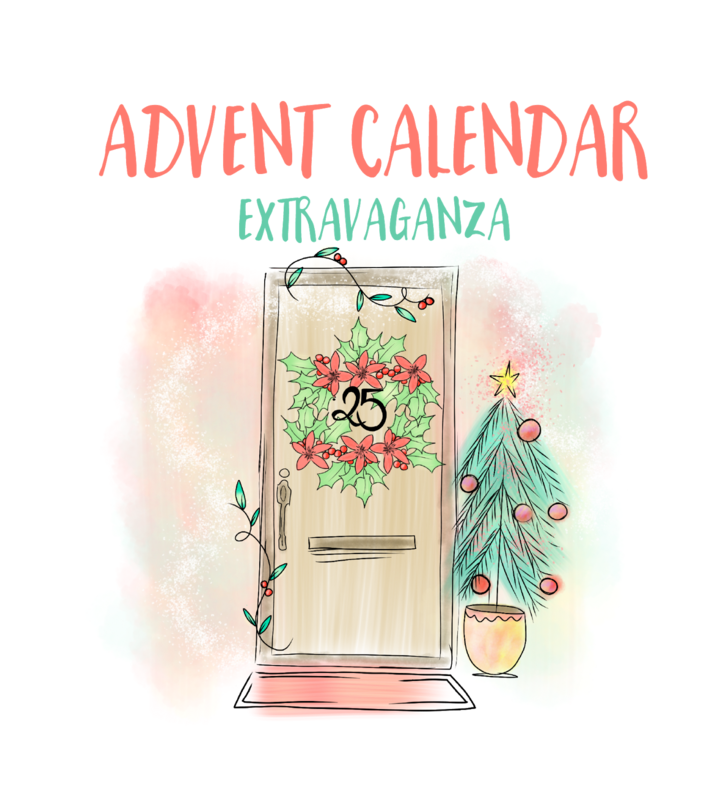 ;) I look forward to watching the video, and thanks for participating in Taheerah's advent calendar. This has been so much fun to do this year! Ohhh I LOVE this! Your colouring is amazing! Great colouring! Those mice are so cute. Very creative. Love your coloring, masking, and design. Just lovely. Happy Holidays! Great happy Christmas card, in beautiful colours. Those mice are so much fun ! awww, so cute! thanks for the video! Love the mice investigating the presents. And your stories! What a fun card and i love your stories! Now I have the song Long Time playing in my head! Love your card! The redo was perfect! Love the card. It turned out great. I love what you created--a little piece of art. The mice are super cute! Great card, love the large presents. 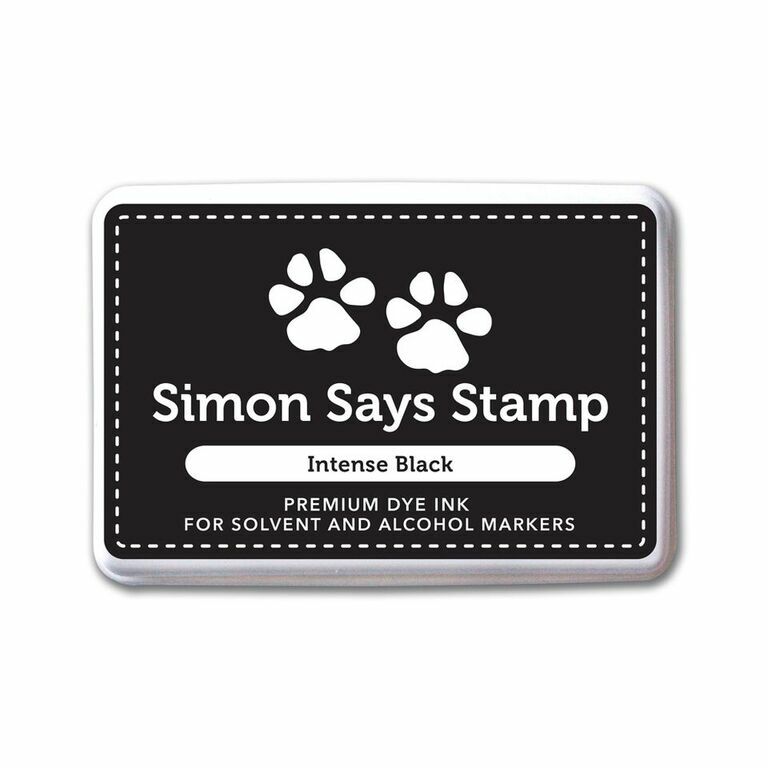 I like the color combo you went with for the ink blending :) Good choice! I love your cards! The colors, your stories. Always enjoy your posts! This is adorable, how cute are those little mice dancing on the presents?! You always make such beautiful and colorful cards! Love the vibrant colors. Thanks for participating in this fun event!! Love the card! So cute! So sweet and cute... beautiful colouring as always. Your card is so sweet and colorful. Love the final version. It also seems to me that the red package is actual deep red velvet covered box with the jewel on top - must be something wonderful inside. Don't forget to tell hubby thanks again for all the effort he put into making your day so special. Your coloring is gorgeous and the mice are too cute! Wow, your coloring is fabulous! What a beautiful card. You always inspire me Kelly with your incredible creativity. I love Waffle Flowers stamps & dies and the creative way you thought to use these particular stamps so inspires me to look at my own a little bit differently, thanks for that! Love all the elements on your lovely card. The little mice are too cute. Awesomeness! Love the card and your creative eye of using the shoe toppers for bows! You win today! Great card Kelly, I love watching you create and your rambling is always entertaining! You are so clever with your fabulously bright colored holiday card!! You had me at T ruler!! Are you kidding me!??? And those mice dancing atop! Wow, girl, I need to color like you do!!! This card just made me happy. Loved your coloring and detail. Even liked all the background story to this. OMG Kelly I love your cards and watching your videos! The mice are so sweet and your coloring is gorgeous! So bright & cheery & fun! Love this sweet, happy, cute and colorful card! I love mice on Christmas time. I don't know why but I do. Maybe it's about all of the sneaking around Christmas Eve. Your card is so colorful and I really liked the green background. Thank you for sharing. Your card is so cute. I love the dancing mice. Really wonderful colouring on this card! So whimsical and fun, and those packages are exquisite! Love your card and that you showed the whole process! Thank you for Sharing! Don't blame you for adding the mice...brilliant idea. They are so darn cute! Thanks Kelly for the wonderful video showing your coloring process. Awesome. Love your card. You always inspire me to try something new! As always, beautiful card. You are such an inspiration. Very cute card. Thank You for the inspiration. Hi Kelly!! Beautiful, wonderful an amazing card!!! I do enjoy your cards and your stories!! Your hubby sure is a sweet man!!! Your card is lovely and I'm fascinated by how you "fixed" it! Thanks so much for your videos and sweet stories too! Merry Christmas to you and yours!!! Great card, your coloring is fabulous. Those mice are so stinkin' cute! Your coloring skills are epic and so is your attention to detail! This is absolutely adorable. Thanks so much for taking part in this special event with Taheera. What an inspiration. Fabulous card! Those mice around the presents are just adorable! WOW Kelly, you did it again....wonderful card. I love that you show how you "fix" mistakes and everything is worth saving. Thank you so much for sharing. OMGeee! I love this! Your coloring blows my mind! What a happy card - the mice are so cute! The colors in this card makes such a happy card. Thank you for sharing. Your card is adorable and the bright colors are wonderful. oh my God that's so cute!!!! Love the mice with the present on your card. Cute card! Love those adorable mice on top of the gifts. Your card is so pretty and so cute although right now I am not loving mice. We had a box of Old El Paso Stand and Stuff Taco's on the shelves in our basement and the only thing left was a box with a hole in it. Yes, mice! So you can see why I am not loving mice at the moment, although I can say I do love yours. Everything is so colorful and that is so me. I love that beautiful bow and the bejeweled thing on one of the presents. I love everything on your card and I love how on this Advent Calendar no 2 cards are even remotely the same, not even close! I am loving this whole thing! Off to bed and tomorrow more doors to peek into and more beautiful, creative cards to see. I can't wait! Thanks for showing us your adorable card and I hope the skating mouse doesn't fall and for giving us the chance to win something. 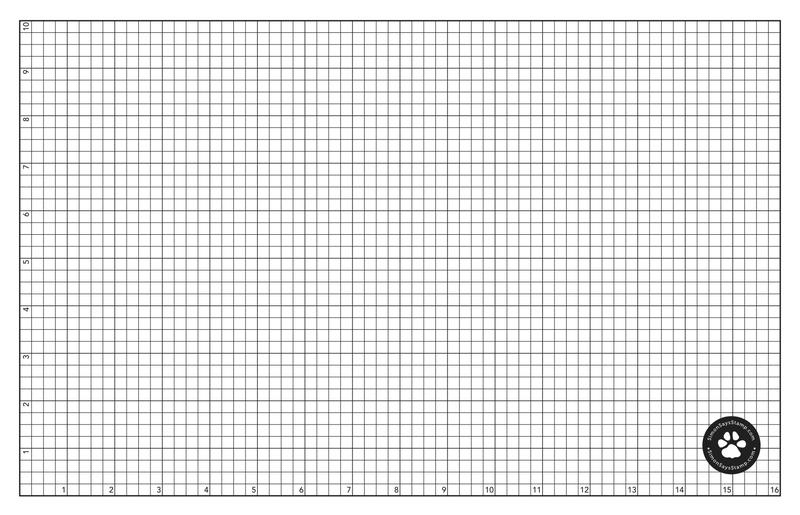 I will get as creative as you when I win something from one of the stops on this calendar. What a gorgeous card! The packages are beautiful! Bet there's cheese in them--the reason the mice are hanging around. This is so fun & festive! Great colouring too! Love your card - your coloring skills are the best, Kelly! So cute. Love those cute dancing mice! You beautiful background with the gorgeous coloring makes for a wonderful card! Super cute card! So much detail! Super cute card Kelly! Love the darling images and the bright colors. Fantastic coloring! These mice are super cute! I love the bright colors and the fabulous bows on the presents!! What a fun card!! Great job!! Thanks for sharing!! Merry Christmas! Your card is fabulous! Thanks for the video and your tips. Your mice and presents are perfect together! Love your card! the mice added fun life to your design! Your card screams fun and happy!! Awesome card. Thank you for sharing and making the video. NOT Very Fond of Mice however, these critters are so cute and adorable! Great usse of color! Well done! Stunning card! Beautiful composition, image and bold colors. Love Waffle Flower and I love the intense colour on your card. Very cute and your fixes -- well they really fixed it. Went from meh to wow. Such a cute, fun card Kelly! Thanks for sharing! Wow - how creative you were. The finished product is so colorful, so playful, and so inviting. I want just one of those gifts! Cue card! These little mice are frolicking among some huge gifts! Beautifully colored presents and how cute are those mice? I like the snowdusted rose!! Just gorgeous!! Love those stunning present toppers and how you made your own presents to accompany the toppers. Also love the green background that ever so softly fades out. It really makes the presents pop! BEAUTIFUL card! Love the pretty gifts and cute mice! Your cards are always so cute. Love the flower used as a bow. Great idea. Love the mix of presents, bows and critters. So cute! That is such a fun and bright card! I lvoe the advice too, never give up! What a fun, happy card. Love it. I love this card it's amazing! Your colors are perfect for the holidays. So vibrant. Great background and foreground. Thanks for sharing! Very cute and lovable card. Love the bow. This card is fabulous! And you are a riot! Your video was so entertaining, I just loved it! Beautiful festive colours on this card. Thanks for sharing the technique video. Your card is so stinkin cute and super fun. Love your cute card and your stories... Merry Christmas! Love these colors and the simply sweet little scene! Your card is absolutely adorable!! Brilliant vision to create something fabulous with these fun stamps!!! ...and your video was so fun to watch...love the stories! Love the video for the stories as much as the card. Thanks for keeping it real about the reworking. Love the mice and how you arranged this card. Ack! These mice with those big presents, the cutest!!! Kelly I love the stories you include in your videos. This card is so clever. You made your own packages with lots of fun trimmings and cute mice. Hope you and your family had a great Christmas. I adore your colourful card and those cute mice!